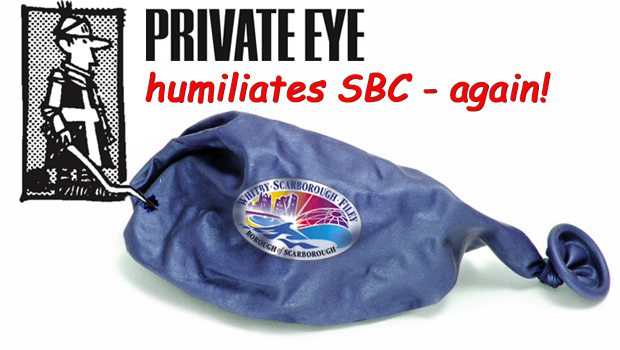 an “In My View” article by NIGEL WARD, reporting on Scarborough Borough Council’s latest national humiliation – hard on the heels of the erupting SAVILE/JACONELLI scandal. 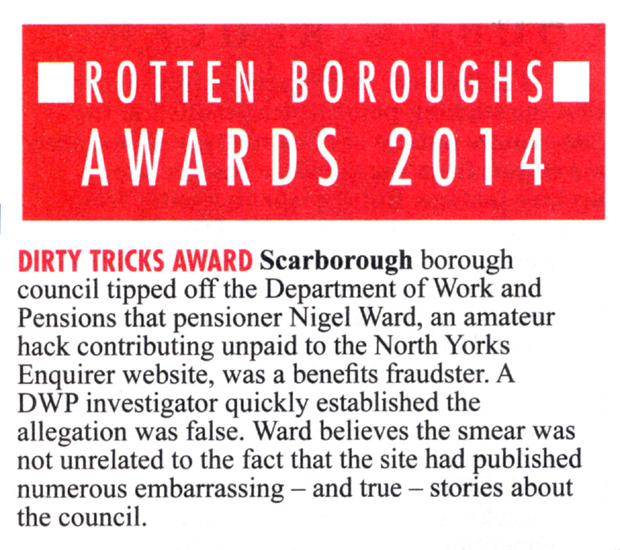 The Private Eye ‘Rotten Boroughs’ feature has now published its annual Awards for 2014. Before presenting readers with a scan of the Awards announcement (which appears later in this article), I believe that it may be helpful for readers to glance over the following background information in order to place the scan in its full context. 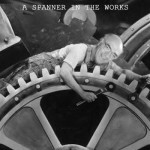 On 16th March 2014, I published an article entitled “The Genie Is Out Of The Bottle”, in which I reported on the unsolicited (though serendipitous) arrival in my mailbox of a photocopy of a 55-page disability benefit application dating from December 1996, filled in by a serving Councillor on behalf of another serving Councillor (who, at the time, were engaged in a clandestine adulterous relationship). I was only one of a considerable number of recipients, including several Councillors, and (I am told) the Council’s Monitoring Officer Lisa DIXON – the very same Lisa DIXON whom BBC Inside Out researchers proved to be a shameless liar. 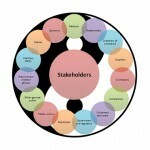 See for yourselves . . . The 55-page application document had clearly been sent to such people as might have been expected to demand that steps should be taken to establish whether or not it was what it appeared to be – a classic example of benefit fraud. 12: “I need help to put on my shirt and trousers, socks and shoes”. 14: [In response to a question regarding nocturnal use of the toilet] – “In winter I have a bottle which my wife holds for me as it is cold”. 18: [In response to a question regarding assistance with medication during the night] – “Cannot reach pills”. 19: [In response to a question regarding the preparation of food] – “My hands are very stiff and I drop things easily. I cannot always turn tap off”. 20: [In response to the question “Do you need help at mealtimes?”] “I can manage with a spoon”. 27: “I have piles and when I have had my bowels opened my wife has to help because I get[sic] not reach myself to put cream on and keep me clean”. Given these mortifying personal difficulties (which, according to the claimant, had persisted throughout the previous five years), one wonders how the poor soul was able to discharge the business of the Council, let alone his own movements”. For clarity, the ‘wife’ referred to in the document was not the applicant’s wife but the woman who usurped that position – the mistress. 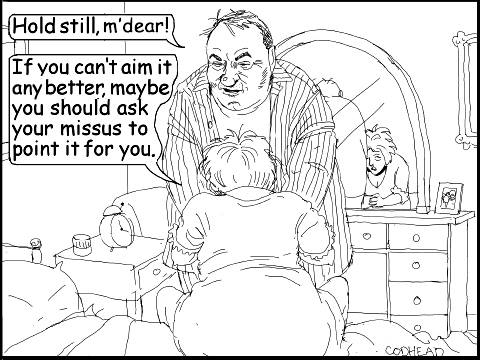 Our resident cartoonist CodHead lampooned the fraudsters mercilessly. Unsurprisingly, it was not long before the mortified duo – having ensured that neither could testify against the other by the simple expedient of marrying i.e. 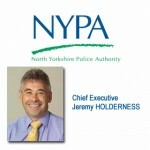 ‘spousal privilege’ – sought to wreak their retribution. 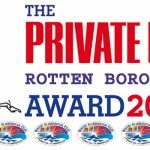 The following excerpt from the Private Eye ‘Rotten Boroughs’ feature, entitled “SCARRED BOROUGH” – “Private Eye Slams Scarred Borough Council – Again!” – describes, far better than I ever could, the next phase of this despicable saga of criminality – an attempt to frame me for benefit fraud. 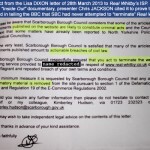 The SBC response to this damning account was that SBC Monitoring Officer Lisa DIXON emailed all Councillors with her typically disingenuous damage-limitation bluster – described in excruciating detail in my 4th June 2014 article entitled “Lies, Damned Lies and DIXON DoubleSpeak”. 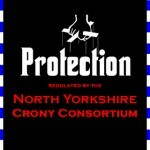 But it must be a terrible thing for Lisa DIXON to live with – the knowledge that irrefutable record exists (and stands for all time on the world wide web) – exposing her as a disgrace to the legal profession who has sold her integrity in exchange not for a few pieces of silver but for a vastly inflated salary of £72,000 per annum. I struggle, at this moment, to recall an entirely apposite Shakespearian term for a woman who sells her honour. 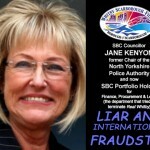 And now her mortification has been exacerbated, because Private Eye has elevated Scarborough Borough Council – main protagonists (in this case) Portfolio Holder for Finance, Procurement & Legal Services Councillor Jane KENYON-MILLER (well know to readers for her abuse of position as Chair of the now obsolete North Yorkshire Police Authority in attempting to have NYE investigative-journalist Tim HICKS arrested to prevent further exposure of her tax-fraud in respect of her bankrupt California IT venture, Belvedere Computers Incorporated, and many other acts of gross impropriety) and her Officer counterpart, the aforementioned Director of Legal & Democratic Services and Monitoring Officer Mrs Lisa DIXON) – to the very pinnacle of notoriety as the most underhanded and conniving Council in the country; the ‘Rotten Boroughs’ DIRTY TRICKS AWARD 2014. Will somebody ‘in authority’ kindly explain to me how it can be that these publicly-exposed serial abusers of entrusted power for private gain can conceivably still be in office? Are they not the very incarnation of CORRUPTION?